Menulog delivers for Tonari so you'll be able to track your courier on a map. Boiled soy beans lightly seasoned with salt. Fried mashed potatoes bread crumbs. Choice of pork, prawn or vegetable. Octopus cakes with sauce grilled vegetables. Deep fried tofu with homemade teriyaki sauce. Fried king prawn with mayo sauce. Pancake style vegetables with Japanese sauce. Bread crumbed pork or chicken and cabbage with sauce. Grilled sliced beef with vegetables. Thinly sliced beef and vegetables with noodles. Grilled marinated beef rib with vegetables. Grilled eel and variety of vegetables. 5 x Nigiri, 9 x Sashimi and 1 x Roll. 9 x Nigiri, 18 x Sashimi and 1 x Roll. 16 x Nigiri, 25 x Sashimi and 1 x Roll. 4 x Assorted nigiri sushi. 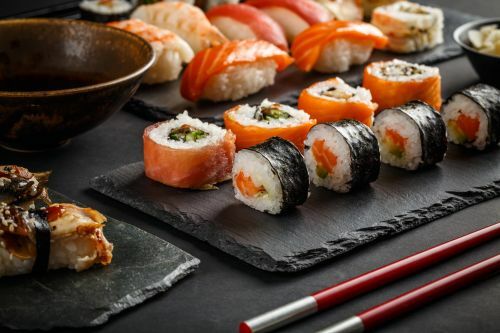 8 x Assorted nigiri sushi. 5 x Assorted nigiri and roll. 5 x Tuna and 5 x prawns. 5 x Salmon and 5 x prawns. 5 x Tuna and 5 x salmon. Assorted salmon, tuna and whitefish. Grilled tofu, mixed green salad and rice. Grilled beef or chicken, mixed green salad and rice. Deep fried bread crumbed pork loin or chicken and rice. Grilled salmon, green salad with teriyaki sauce and rice. Prawn, salmon, 2 x chicken and vegetables. 2 x King prawn, 2 x whitefish, 2 x calamari and vegetables. Vegetables with noodles in soy soup. Dumpling and vegetables with noodles in soy soup. Fried prawn and vegetables with noodles in soy soup. Stir fried noodles and chicken or beef, tofu with sauce. Tofu with vegetable sauce on rice. Chicken with vegetable sauce on rice. Bread crumbed pork or chicken with vegetable and egg sauce on rice. Raw fish and vegetables with spicy sauce on rice or noodles. Seaweed and vegetables with wafu dressing. Fresh tofu and vegetables with dressing. Green tea noodles and vegetables with dressing. Salmon and vegetables with wafu dressing. Fresh tuna and vegetables with spicy sauce.